Directions: The Flatiron is located on 175 Fifth Avenue in New York City, zip-code 10010. To get to the Flatiron you can take the N or R train to the 23rd Street station which lands you directly between the Flatiron itself and Madison Square Park (home of the original Shake Shack). The Six and One trains also both stop on 23rd Street and it's a short walk along 23rd Street from either station to the triangular intersection of the Flatiron. 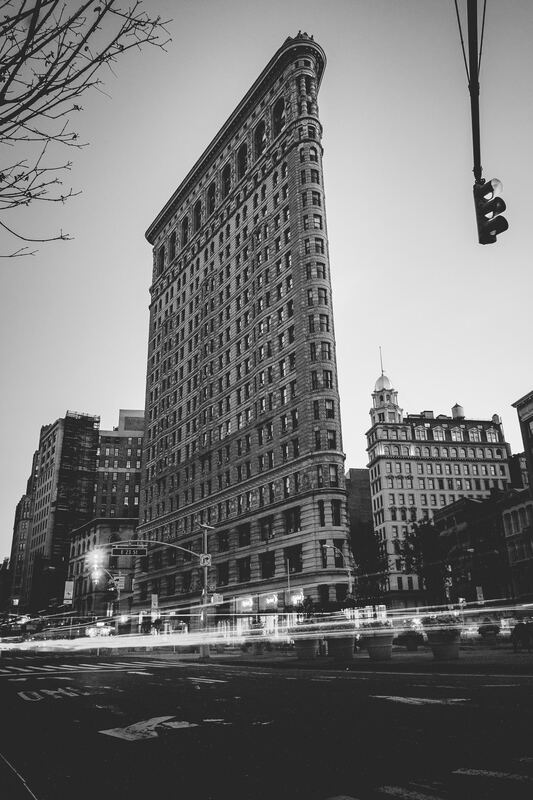 The Flatiron was constructed in 1902 and at the time was one of the tallest buildings in New York City. It’s characteristic triangular shape, formed by Broadway, Fifth Avenue and East 22nd Street, makes it one of the most iconic buildings in the city. 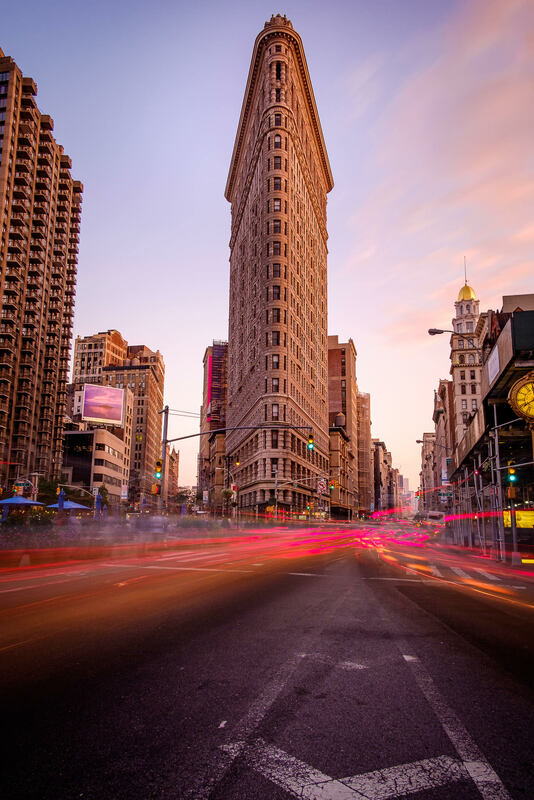 The most common place to photograph the Flatiron lies just north of the building at the tip of a triangular road divide where 24th Street merges onto Fifth Avenue. This divide is accessible by crosswalks and has several large planters in place to prevent traffic from crowding the area. This location allows you to capture the frontal facade of the Flatiron and moving traffic from both 24th Street and Fifth Avenue. There is another larger traffic divide with a kiosk and chairs that splits Broadway and Fifth Avenue with a more skewed view of the Flatiron, however this angle loses the composition of the busy traffic on the streets. The building can be photographed from Madison Square Park which provides a different angle of the building. 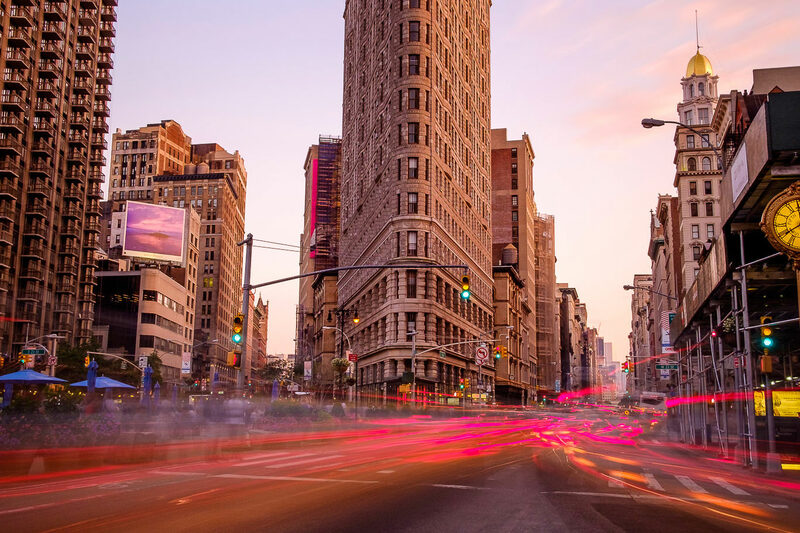 The best time to photograph the Flatiron is just after sunset as the street and traffic lights emerge. The building is not well lit at night so to get the best balance in your shot, it’s best to photograph the scene when the luminance sky matches that of the street lights. Don’t forget to bring a tripod and neutral density filter for capturing light trails. In the area is Madison Square Park, where you can catch a bite to eat outdoors at the original Shake Shack, with views uptown to the Empire State Building. Eataly is close by as well, with it’s rooftop Bar and Restaurant, Birreria which provides excellent food along with nice views of Midtown Manhattan. Union Square and the Empire State Building are also not so far away for visiting.